The French-born designer began his career working on set design and visual effects for the TV and film industry. He moved into theme park design in the early 90s with Walt Disney Imagineering. 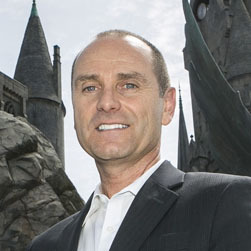 In almost all of its international markets, Universal now functions as an extremely strong competitor to Disney. The introduction of The Wizarding World of Harry Potter has been transformational for Universal Orlando Resort and Universal Studios Japan. More recently it has contributed to a significant attendance boost at Universal Studios Hollywood. These immersive lands have become an industry reference point for the use of theming and intellectual property. Over two decades with Universal, Coup has also helped create such notable attraction as The Amazing Adventures of Spider-Man, The Simpsons Ride, King Kong 360 3D and Transformers: The Ride 3D. His innovation, insight and creative flair will no doubt be invaluable to Universal Parks & Resorts as it prepares for the launch of its first theme park in China, Universal Studios Beijing.